There are many customs in every festival of Hinduism but we often do not know the purpose behind them. 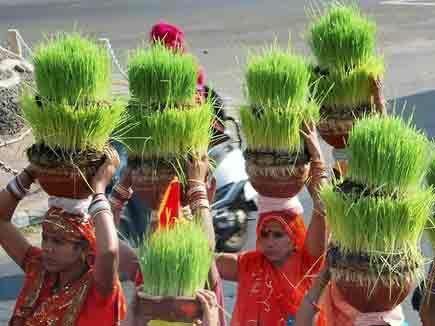 In the Navaratri, wheat and barley are sown in a pot of soil in front of the urn and it is also worshiped. It is believed that after the creation of earth, the first crop was barley. Barley is also called full crop. The main reason for sowing of barley is that food is Brahma therefore food should be respected. Not only is the importance of planting barley in Navratri but it also important that how fast it grows. How much does barley grow in nine days, it is a sign of our future. Growing of barley is considered a sign of happiness and prosperity in the house. If the barley does not grow dense or does not grow properly then it is considered inauspicious for the house. If the barley is white and is directly grown then it is considered auspicious. If the barley grows rotten black then it is considered inauspicious. If the color of barley is yellow from the bottom and green above then it is believed that the beginning of the year is bad. On the contrary, if the colors of the Jayanti is green below and yellow to the top then the beginning of the year is good but later one face problem. If the barley grows thick and green then it indicates the whole year pass well. If there is some inauspicious sign with the increase of barley, then recite the beej mantra of goddess on Asthami for 1008 times. Also, pray to goddess to remove the problems.